Most people spend more time in the bedroom than in any other room except perhaps the office, so this room deserves an extra dose of feng shui attention. Feng shui is the ancient Chinese art of managing energy, or ch'i, to create harmony in the home. The number of practitioners and consultants has grown steadily in the West since the early 1970s, and they all agree with the ancients that the bedroom is is a place of rest and should be designed and decorated as such. In the bedroom, you're generally in a yin—_or a —state. When you're asleep, your subconscious is still aware, and it's affected by the colors, lighting and sounds around you. The goal of feng shui is to manage those and other factors to provide a restful space that nurtures your subconscious while you're asleep so you feel more positive and life-affirming when you're awake and in a _yang state. The bed is in a so-called power position when you can see the door when you're lying in it. The bed should never be directly across from the door, though. That's traditionally called the "dead man's position" because dead people are traditionally carried feet-first out of the bedroom. Some feng shui practitioners recommend sleeping on a full or queen-size bed, even if you live alone. Doing that while leaving space around the bed on all sides invites love into your life in the form of a relationship. Having something solid behind you while you're sleeping provides a sense of security and helps you sleep better. If you want to use a headboard, make sure it's a wooden one. A headboard is particularly important if you have to place the bed in front of a window. The bed should never be placed against an uncovered window, because doing so makes you feel like you're floating when you're asleep. Many feng shui consultants recommend painting the walls with light earth colors, such as beige and light brown, to promote the feeling of grounding and security. The best choice of colors also depends on how on several other factors, including how you use the bedroom, what you want to invite into your life and the bagua map of the house. Shades of light red and orange are fire colors and are recommended if you're looking for a love relationship. Cool colors, such as blue and gray, invoke water and metal and help create an austere feeling more conducive for meditation. It's best to avoid bright yellows and greens because these invoke the vibrancy of growing life, symbolized by wood. However, a small green feature would be appropriate in an east-facing bedroom, because east is the direction of wood. Mirrors are used in feng shui to create light and to deflect ch'i away from obstacles, but the bedroom isn't a good place for them. On no account should you be able to see yourself in a mirror when you're in bed. That creates the subconscious impression of another person in the room. It disturbs sleep and it prevents a real person from entering your life. If you have to use mirrors, make sure they point away from the bed. Don't turn the bedroom into an office or a recreation room by bringing in technology. That's bad feng shui. Leave the gadgets in other parts of the house and close the bedroom door at night. If you need a clock, use a small bedside one that's quiet and doesn't have an illuminated screen. Some practitioners even recommend turning off the wi-fi at night. Stagnant, stale air is synonymous with stagnant ch'i, and it's not conducive to a good night's sleep. If you can, leave the windows cracked to create a cross-draft and make sure you have enough blankets to keep yourself warm. If it's too cold out to open the windows, leave the door ajar to allow air from the central air system to circulate freely. When all else fails, use a fan. The bedroom isn't a library and it isn't an appropriate place for a bookshelf. One or two books that you're currently reading, however, contribute to a homey, comfortable feeling. They attract you to the bedroom, and they help you sleep. As soon as you're done reading a book, stow it on the bookshelf, preferably in the den or another designated reading space. The issue of bringing plants into the bedroom is controversial. Some practitioners are dead-set against it for the same reason you don't want to paint the walls green or yellow. Plants signify the wood element, and their vibrancy of this element mitigates against a restful sleep. On the other hand, plants absorb carbon dioxide and fill the room with oxygen, which is undeniably good for you. One or two plants probably won't keep you awake at night and are a great addition in an east-facing bedroom or in a room overly-dominated by the earth element. There should be bedside tables on both sides of the bed, and they should be kept as clutter-free as possible. Put a lamp on one or both of them, and perhaps some other object, such as a crystal, to create an altar or a focus of meditative attention. If you use an aromatherapy diffuser, the bedside table is the place for it. The shape of the bedside table contributes to the balance of the elements in the room. A square table signifies earth and stability, while a round one stands for metal and creativity and is probably a better choice in a room already dominated by earth. You want to fall asleep in the bedroom, not fall into a stupor. As part of the "reduce clutter' prescription for all parts of the house, feng shui recommends keeping the space under your bed clear. Random objects stored there prevent ch'i from circulating around the bed and interfere with your sleep. A few extra blankets or a pillow or two are okay, but anything else should go in the closet or be stored in another room. When closet and cabinet doors and dresser drawers are open, their interior spaces become part of the room. Ch'i that circulates through these spaces tends to stagnate, and you feel the effects as surely as if the items they contain, such as hanging clothes or socks stuffed into drawers, are strewn around the room. 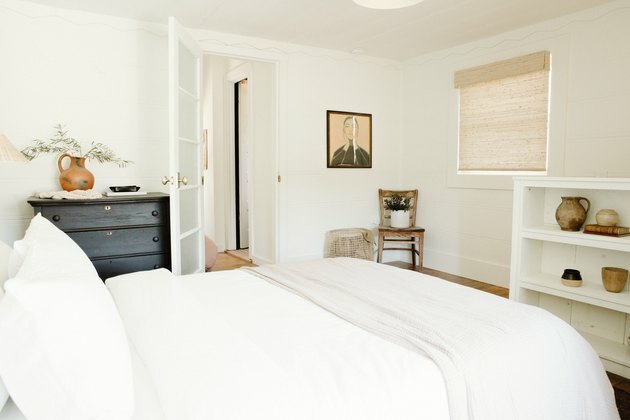 The bedroom is a great place to hang inspiring artwork showing landscape scenes or nature portraits. If you want to hang pictures of relatives, use the east wall, which is the one that signifies family. Creative abstract art should go on the west wall, which is the wall of creativity. The south wall, which is the one across from the door, is the best wall for showy, dramatic artwork. Tabletop sculptures made of stone or wood. You can use the objects to balance the elements in the room, is which important for the proper flow of ch'i and the harmony of the room in general.